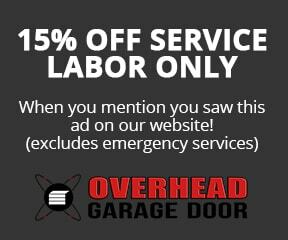 Overhead Garage Door was founded on putting their customers first. 35 years later they continue that tradition with it’s Vernon Hills and Lake Country residents. Overhead Garage Door’s commitment to providing the best garage door repair and garage door installation service in Vernon Hills has produced recognition from many of the industry leaders. “Great! Amber set up the appointment quickly and with the times good for us. Glen showed up on time (to the minute!) and was both professional and personable. He checked all aspects of the garage door and made adjustments as necessary. The door opens quietly, and closes securely. We would definitely use Overhead again, and will recommend them to friends and neighbors.” – Susan. In addition to servicing our customers to the highest standards, Overhead Garage Door works with proven quality products to complete garage door repairs and garage door installations in Vernon Hills. If you have a garage door repair emergency in Vernon Hills, call Overhead Garage Door immediately. As a part of the Lake County community, you’re our priority. Vernon Hills residents receive same day garage repair services 24 hours a day. We have thousands of parts available for any garage door repair and can also provide free estimates on new garage doors and installations.